The Holmes County Health District receives reports from healthcare providers to identify trends or outbreaks of infectious diseases. Based on the information reported, we then conducts necessary investigations to determine the cause of abnormal incidences of infectious diseases. This infectious disease information is vital in assisting us in protecting the residents of Holmes County from this public health threat. Healthcare Providers with knowledge of a confirmed or suspected case of a reportable disease are required by Ohio law to report it to the local health department as outlined in Ohio Revised Code (ORC) 3701-3-03 http://codes.ohio.gov/oac/3701-3-03 and ORC 3701-3-05 http://codes.ohio.gov/oac/3701-3-05. Please contact Jessica Boal (jboal@holmeshealth.org) or Jennifer Talkington (jtalkington@holmeshealth.org) if you have any questions regarding communicable diseases or disease reporting. Click here to view the most up to date flu report for Holmes County. Previous flu reports may be found on our data and reports tab. 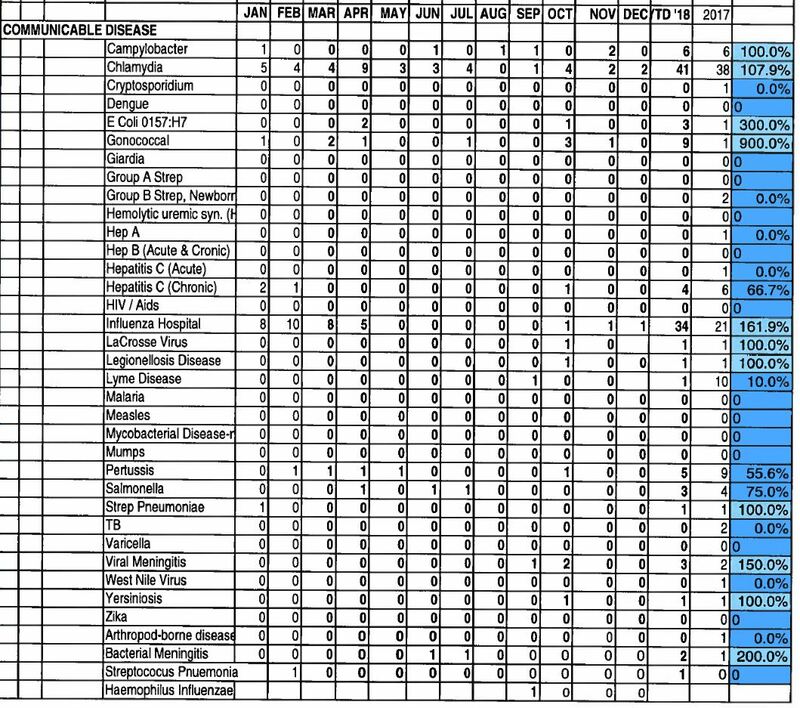 The following chart shows the number of confirmed communicable diseases cases that the Holmes County General Health District investigated in 2018 (see column “YTD ’18). These diseases are reportable to the local health department by Ohio law. The numbers shown represent laboratory confirmed cases. The data from 2017 is also provided as a comparison. In 2018 there were 112 confirmed communicable diseases in Holmes County. Chlamydia had the highest incidence with 41 confirmed cases. Influenza associated hospitalizations had the second highest incidence with 34 confirmed hospitalizations.